Walk to School programs have a checkered history. A large recent program in inner Sydney schools, for instance, focusing on educational interventions, produced ‘mixed results’ for major a 2 year effort. Yet here is an example from Queensland that met with outstanding success. Just check these results, for a 12 month effort.....(see graph). I just had a look at the evaluation of this program and one thing stands out: getting the SETTING right. Before the project began, the Travelsmart team conducted a site audit at the Tewantin school, along with officers from the Qld Transport Road Safety Office and Noosa Council. The audit resulted in an agenda of road infrastructure improvements around the school. Specifically: speed signs, road markings, threshold treatments, and intersection improvements, all focused on safety. This physical investment (amounting to $78k) “to improve the environment for walking and cycling around Tewantin School meant that there were little physical barriers to address”. The Travelsmart program then rolled out, with a volunteer parent-teacher working group and $27k spent on activities including an access guide, a poster, a cycle skills course, teaching units, a TravelSmART competition, a staff Walk to Work day, a Walk and Ride Wednesday, an interschool class challenge and a celebration assembly. This points to a valuable principle of behaviour change projects: a major factor that enables behaviour is THE SETTING…a principle that goes way back to the Ottawa Charter (‘Creating Supporting Environments’) – one that’s now very well recognised in health promotion projects. Most of the Trewantin TravelSmart activities focused on ‘salience’ (bringing cycling and walking to front-of-mind) and ‘buzz’ (getting people talking). However I suspect at least two would have had a big impact on self-efficacy: the changes to the physical road setting around the school , and the cycle skills course. These would have changed the environment-of-decision-making for parents, lowering their fears of letting their little ones walk or cycle on their own. After all, it's largely mothers who make the decision about how to commute to school, and safety is a big consideration. A 2005 study in the American Journal of Health Studies noted that a "theme that emerged from all three focus groups was one of (real of perceived) personal safety issues and concerns, including recent or memorable kidnappings, crimes in the neighbourhood, and heavily trafficked streets." It concluded that distance, safety and traffic concerns were the biggest influences on travel to school choice. 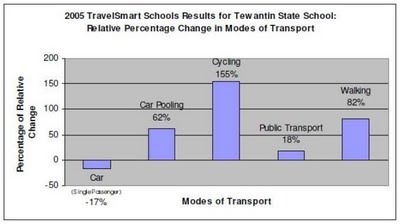 Interestingly, there was little enthusiasm at Tewantin State School for formal walking, cycling or car-pooling programs because of fears that parents would be unwilling to volunteer for those duties. Informal arrangements were preferred – a useful lesson. An nice touch was writing "TravelSmart Coordinator" into the job description of the newly appointed Deputy Principal. The evaluation doesn’t seem to have been published, but you can probably get a copy from Graham Lunney, TravelSmart Manager, Queensland Transport. You could ask him for a copy of the TravelSmart School Training Manual that was developed from the program. TravelSmart Noosa’s web page gives a summary of the project.